Wounded Times: Cincinnati Bell Rejecting Veteran's PTSD Service Dog? Cincinnati Bell Rejecting Veteran's PTSD Service Dog? “Despite repeated effort we have yet to receive any information regarding the current status of Yaunce’s condition and its effect on his ability to perform his duty,” Cincinnati Bell told Fox and Friends. An ex-Marine awarded a Purple Heart after being wounded in combat says his bosses won’t let him come to work with his trained service dog. “I was told by my supervisor that HR said that if I showed up with the dog I’d be fired,” Yaunce Long told Fox and Friends Saturday. Long said he installs phone lines for Cincinnati Bell in Ohio. He has a service dog, named C4, to help him control anxiety caused by post-traumatic stress disorder (PTSD). He was diagnosed with the condition after a 10-year stint in the Marines in Afghanistan and Iraq. He was with counter-intelligence. Long said that each day for a week he was sent home without pay when he showed up with C4. Clear violation of ADA. 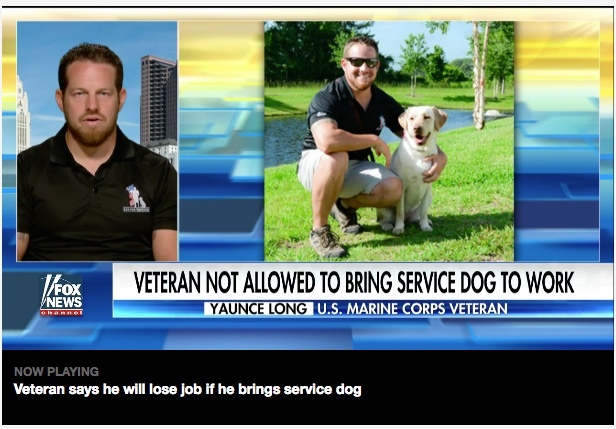 Allowing his service dog is not an unreasonable accommodation. They will lose in court and public opinion. It would be great if business owners decided to learn the law before they pulled a stunt like this. Then again, since too many business owners got away with it this long, they probably decided they didn't need to stop violating it. Glad disabled people are fighting back in public.